For the past week and a half, my family and I have had the pleasure of traveling through the entire state of Florida. We have become an even closer unit being able to bond in the limited space of hotel rooms, sharing one bathroom the entire time, and awing at the amazing views of beaches and palm trees. The highlight of our trip was being able to visit the infamous Legoland Theme Park! You guys, I was even excited to be apart of all of the fun and excitement. When you do decide to bring your family, be prepared for a day full of joy and laughter. 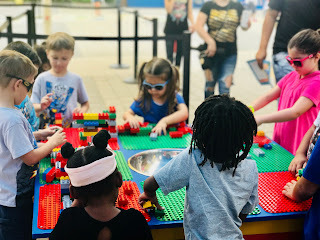 We had such an amazing time, that my four and five-year-old didn't even mention being tired of walking one time! That's pretty amazing if you ask me. Let your preschooler not be so interested in something, they'll complain the whole day. 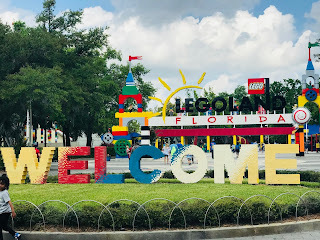 Other than expecting a super exciting time, I didn't know what else to look forward to on our trip to Legoland. 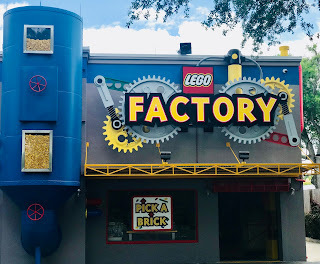 From the very beginning, I was impressed at the fact that they have lego tables set up at every entrance, including the first one to buy your tickets. I giggled a little on the inside, because my kids love to build and create, so having a lego table waiting for them as I waited in line put me and them, at ease. 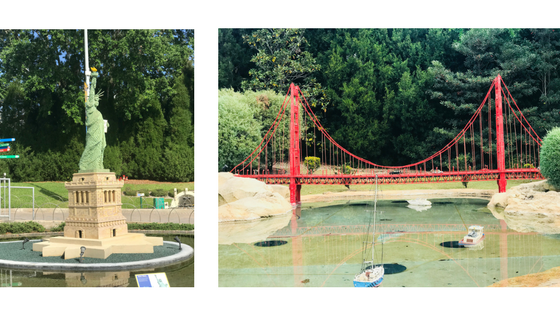 Prepare to be fascinated when you stumble upon the breath-taking Lego sculptures. 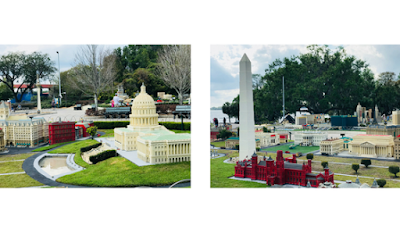 Most of which replicate iconic buildings like the Statue Of Liberty, The White House, and the Golden Gate Bridge. I was astonished at the detail of these monuments made out of LEGO bricks, like woah- that's the definition of discipline and determination right there! 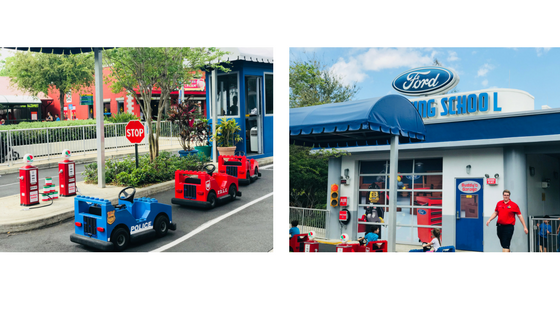 My kids loved the Driving School and even drove their cars a couple of rounds before moving on to another ride. The attendant was also the sweetest having to help a handful of toddlers and preschoolers navigate around the track. The joy in all their eyes and ours (the parents) was priceless. 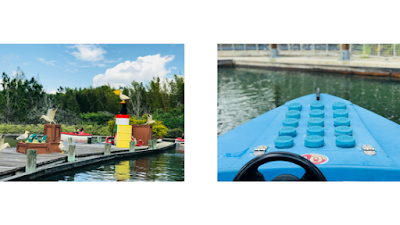 There was even a Lego City Boating School not too far away that we enjoyed as well. Kids love being in control- and these rides were perfect for their little brains as they had to use all of their senses and skills to navigate around the water. Beware of the indoor section of Legoland! Especially if you have a child that loves technology as much as mine. 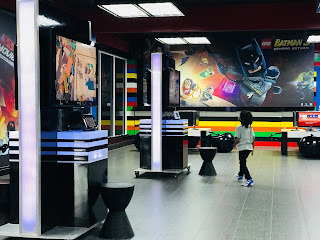 We discovered a room full of kiosks that allow you play your favorite Lego video games- and boy, we sat here for what felt like hours! I'm not going to lie, it was nice to see the joy in their eyes and cool off from the heat, but I had to pull out the bribery card before leaving. I couldn't wait to get home and share our time, but I don't want to spoil your entire experience, so I'll stop- AFTER, we talk about FOOD. 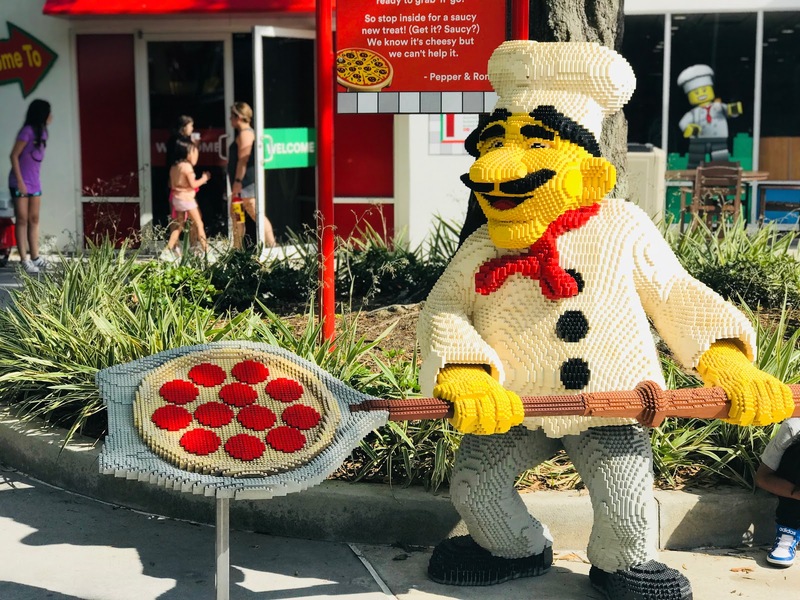 Being that my family and I gave up meat a year ago, I was delighted to find some vegetarian options at the theme park. 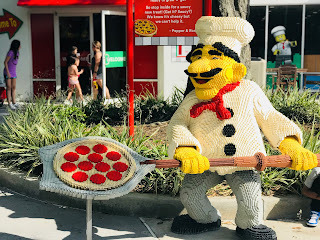 We stuck with pizza, but there are so many vegetarian and gluten-free options available as well at Legoland. The map even divides your options for you, making finding the restaurants super easy! From all of the primary colors that leave you feeling relaxed, safe, and simply, happy when you first walk in- to the inviting lego tables at every entrance to capture children's attention and take their minds off of waiting, to the delicious treats- Legoland is definitely THE place to be in terms of family vacations. Check out this super sweet deal on Groupon. Stay for up to two adults and three kids, with breakfast and dinner included - starting at less than $100 per night. 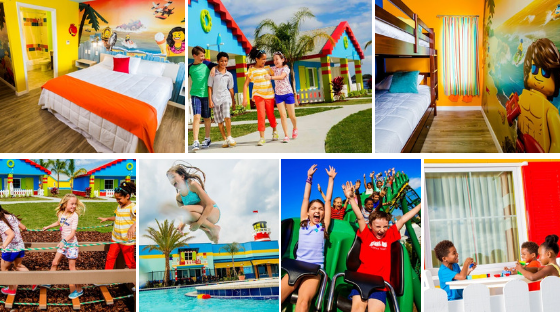 Night time activities include LEGO meet and greets, kids' dance party and more. 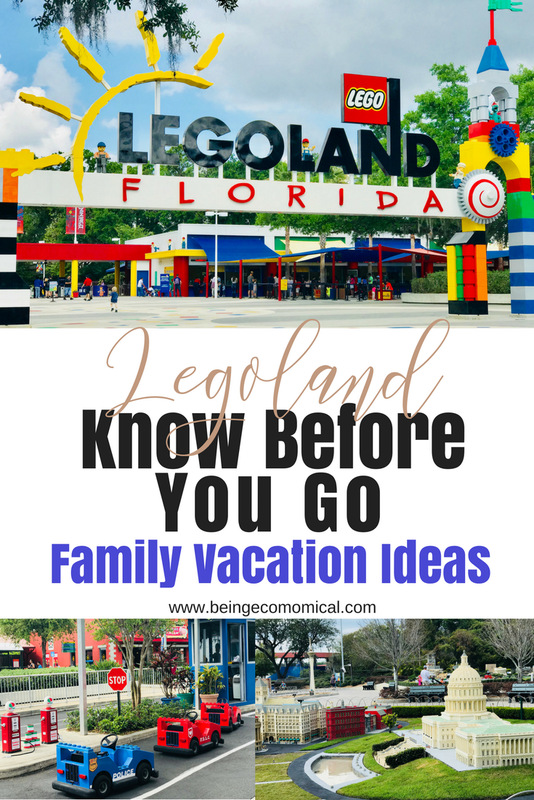 Plus catch a free ride to Legoland Florida. 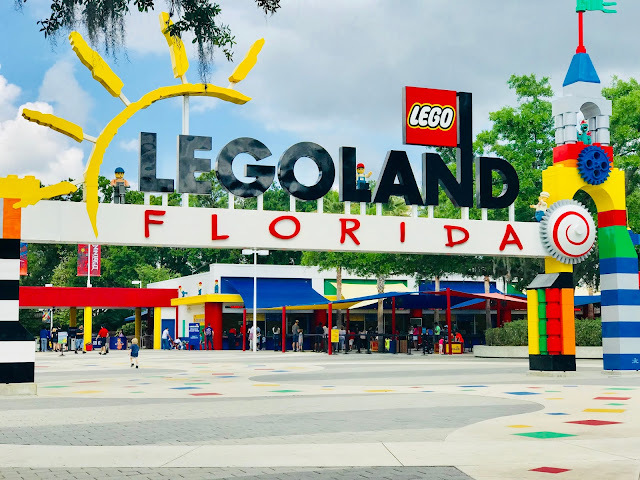 Leave me a comment below if you plan on adding this to your family's bucket list, or feel free to share just how great your very own visit was.